All-In-One Media LCD Displays with built in media player and interactive touch screens ranging in size from 10" to 22"..
Panel PCs for commercial and industrial use with built-in computers ranging in size from 10" to 19". Large Format Touch Screens with built-in computers ranging in size from 23" to 82". The PAE series of touch screens are self-service terminal which integrates hardware and software to create an interactive environment such as product display for sale, and information display for multimedia. The all-in-one network digital signage display are available in various sizes including 10"/ 15"/ 19"/ 22" available for selection. The media files are on a local memory card with a built-in media player or the content can be sourced directly from a dweb server. HTML and Flash are the primary supported file types. The PAB1080PX Series are ideal for department stores, exhibitions, libraries, office buildings, airports, and other public places for advertising, presentations, training and other media applications. The WLP series industrial panel PC includes full-line 10.4” to 19” LCD and touch panel integration. The WLP series support wide temperature fanless usage with stainless, aluminum or external heat sink rugged enclosure. The rugged construction includes Lower Power and a true fanless thermal design. The enclosures have a IP66 rated Water and Dust Proof front bezel. The internals include a built-in HDD anti-vibration module. Your large format LCD Touch Screen can be your first point of contact with your audience, and our large format touch screens are sure to leave a good first impression. 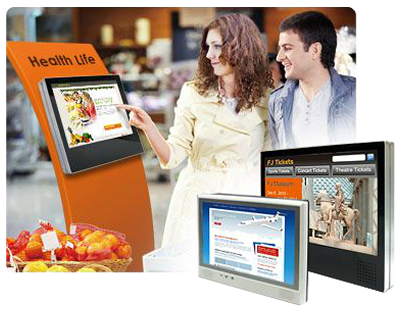 Our unique integrated touch screen solution allows for convenient set-up and enhances the user experience. Plus, the networking capabilities and built-in speakers will deliver the greater operational efficiency and impact you've come to expect from a quality product. Unlike conventional large format screens, our screens have integrated a touch screen solution within range. Simply plug it in and the LFD is ready to go with the infrared touch screen have a response time of 15 to 40ms,. These screens are some of the fastest on the market today and the enhanced sensitivity of the infrared touch screen makes it easy to operate. The screens come with a 3mm protective LCD glass panel, so you can rest assured that your LCD will working for years to come. PAE101V.I.P PRO: Built-in 10.1" LCD display (resolution up to 1024 x 600), resistive type touch and stereo speakers (1W x 2). PAE15V.I.P PRO: Built-in 15" LCD display (resolution up to 1024 x 768), resistive type touch and stereo speakers (5W x 2). PAE17V.I.P PRO: Built-in 17" LCD display (resolution up to 1024 x 768), resistive type touch and stereo speakers (5W x 2). PAE19V.I.P PRO: Built-in 19" LCD display (resolution up to 1280 x 800), resistive type touch and stereo speakers (5W x 2). PAE15V.I.P PRO: Built-in 19" LCD display (resolution up to 1024 x 768), capacitive type touch and stereo speakers (5W x 2). PAE15V.I.P PRO: Built-in 22" LCD display (resolution up to 1680 x 1050), capacitive type touch and stereo speakers (5W x 2). Provides RJ-45 port for connecting to an Ethernet network. Supports VGA out for connecting to external monitor or projector. Supports Audio output for connecting to external speakers. Web based content (W3C WEB Standard) management solution allows you to edit and apply layout design easily. Supports shockwave flash (SWF) format. USB Auto-Copy Function: Automatically copy the contents from Pen Driver to CF card. Virtual Keyboard: The virtual keyboard will automatically appear when selecting the entry field. The range of panel pcs is extensive with many options. The following are a sub-set of available panel pcs. High quality Professional Touch Screens.. Size 23" 32" 40" 46" 65" 70" 82"